Looking for a lightweight but comfortable sleeping bag for backcountry bowhunts? Check out the new Zenbivy Light Bed. A year ago, Zenbivy disrupted the conventional way of sleeping outdoors with its two-piece Zenbivy Bed sleeping bag. Fast forward to today and the company is at it again with the introduction of its Zenbivy Light Bed. The all-new patent-pending zipperless design is 20 percent lighter than the original. 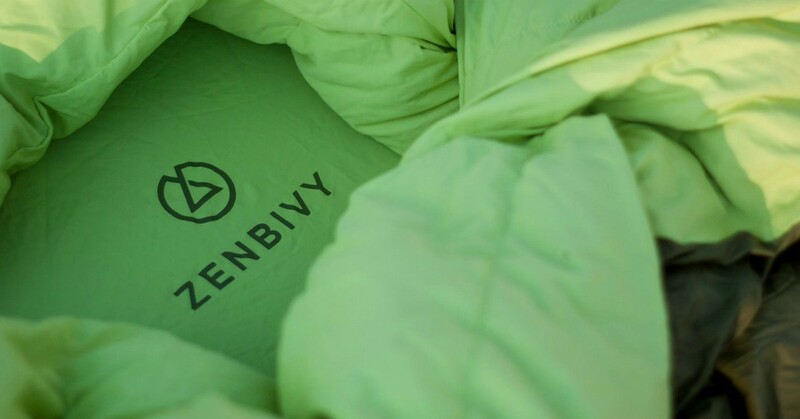 Founded by outdoor industry veteran Michael Glavin, the Zenbivy Light Bed will launch Sept. 13, 2018. With crowdfunding partner Indiegogo, Zenbivy is giving hikers and backcountry hunters the opportunity to take advantage of the very first production at discounted prices. The campaign runs through Oct. 12, 2018. The Zenbivy Light Bed’s reduction in weight makes it competitive with the lightest backpacking quilts and mummy bags on the market. It also ensures that it is ultralight for the backcountry — both as a quilt and as a 23 degree F temperature-rated bag. The Zenbivy Light Quilt weighs 1 pound 6 ounces; the entire Light Bed weighs 1 pound 13 ounces. Much of the weight savings is achieved by replacing heavier zippers with lightweight clips that can configure a flat quilt to one that wraps snugly without restriction. Check out the 40-second video below to see it in action. “Our design goal with the Zenbivy Light Bed was to create the ability to sleep in the same comfortable positions you do at home — all while making it legitimately ultralight for the backcountry both as a quilt and as a full EN rated bag.” said Glavin. The Light Quilt can be configured into a new rectangular design allowing it to be tucked-in at the foot of the mattress for unrestricted foot movement. Plus, whether your natural sleep position is on your stomach, back, or side, the Zenbivy Light Bed allows for natural movement, resulting in better sleep, regardless of whether you’re deep in the backcountry, laying in a hammock or sleeping in the bed of your pickup. Editor’s note: If you’re never heard of a Zenbivy Bed (pics immediately above) and are having trouble wrapping your brain around exactly how the system works, or why it’s different than a standard mummy-style sleeping bag, take a minute and watch the clip below. The video does an excellent job explaining how a Zenbivy Bed (either the original zippered model or the new zipperless design) easily adapts to the conditions and your individual sleeping style. This looks like a simple and effective sleep system for backcountry bowhunts when the temperature could vary greatly from night to night.